Before riffling through a few pages of that library, let’s briefly review the reasons given by Superman for so jealously guarding his secret. The most commonly heard reason is, he’s protecting his family and/or associates. 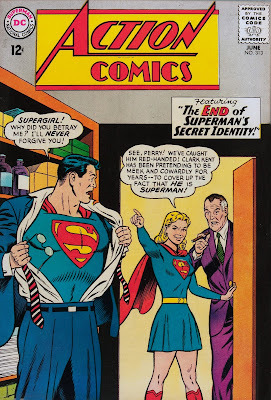 Many’s the time when the Man of Steel has “regretfully” told Lois Lane that he dare not marry her, for fear that criminals would harm her to get revenge on him. Frankly, I wouldn’t want to run the actuarial tables on ANY of Superman’s near-and-dear. They’re constantly being threatened, kidnapped, and so on. Is Lois more safe from a wrathful underworld by virtue of being only Superman’s “girl friend,” not his wife? Doubtful. I have always held that the most important benefit for the Clark/Supes split is that the Daily Planet reporter may interact with people on the same human level. Kent is allowed preferences, likes and dislikes, and leisure time; a 24-hour Superman would encounter many problems trying to express such views. Clark can relax with his friends as peers, freed for a moment from (dare I say it?) the world’s dependence on him. What a secret it has been, come to think of it. One riff on the Kryptonian ode to duality is narrated in Action Comics #371-375. Not even Superman knows his civilian identity, after he’s been zapped by an alien computer-ray machine. After finally latching onto his own resemblance to Clark Kent, an exposure to Bizarro Amnesium restores his memory. With an eye to balance silliness with existential angst, in this article we'll survey a Bizarro’s Dozen (and more!) 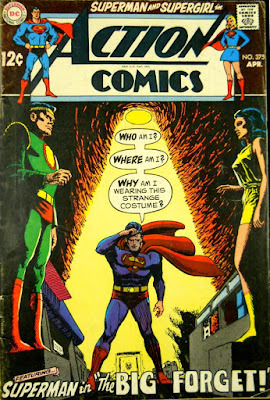 of my favorite Secret Identity stories and situations. See you next Monday for more!